Since 1978, California has required almost all farm employers to pay unemployment insurance taxes on the wages paid to farm workers. In 2005, some 19,300 agriculture, forestry, and fishery employers or establishments paid an average $411 a week to an average 381,000 employeesâ€”employment was 310,000 in the first quarter, 415,000 in the second quarter, 433,000 in the third quarter, and 369,000 in the fourth quarter. There are many reports of farm workers leaving for construction jobs. Construction employment rose by 14 percent between 2001 and 2005, while agricultural employment fell by one percent. 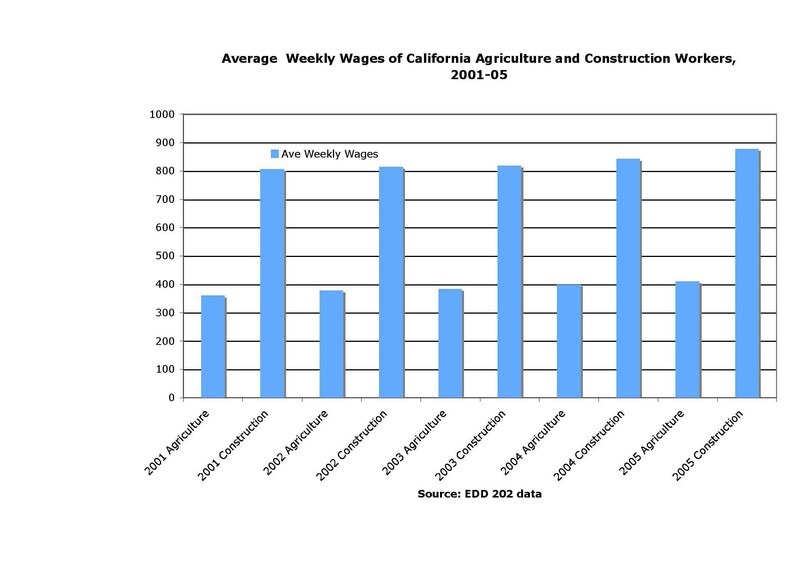 However, average weekly wages rose faster in agriculture, 12 percent, than in construction, eight percent, between 2001 and 2005. Within agriculture, average weekly wages in 2005 ranged from a low of $272 for employees of farm labor contractors to a high of $581 for workers in mushrooms. Average weekly wages were roughly the same in dairies and vegetables, about $500 a week, but significantly lower in fruit and especially strawberries, about $360 a week.